This versatile chickpea salad can be partially mashed for a sandwich/wrap filler or un-mashed and served alongside fresh leafy greens. Either way is delicious! Dressing: Place ingredients in a small bowl and mix to combine. Add a tablespoon or two of water as needed to thin (keep in mind the dressing should be on the thicker side so it may not be needed). Set aside. 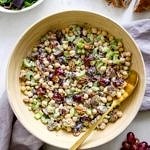 Salad: Add chickpeas, grapes, pecans, and celery to a medium-sized mixing/serving bowl. Top with dressing and mix to coat. Season with mineral salt and fresh cracked pepper to taste. Mashed Salad (perfect for sandwiches): Add chickpeas to a medium-sized mixing bowl, roughly mash 2/3 – 3/4 of the chickpeas using the back of a fork or spoon. Add in the grapes, pecans, and celery, top with dressing and mix to combine. Season with mineral salt and fresh cracked pepper to taste. Make sandwiches, wraps, or simply serve with leafy greens. Store leftovers, if any, in an airtight container in the refrigerator for up to 5 days.